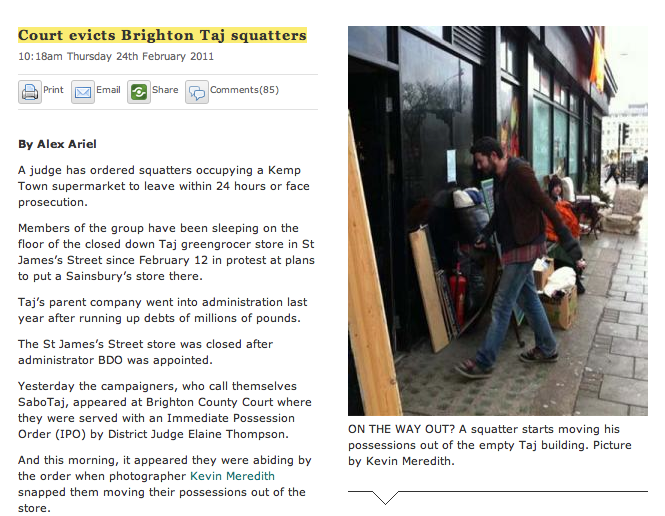 The following post is the last in a series by SNOB(AHA), tracing some of the history of squatting in Brighton. We’d love to hear the stories from your area – get in touch with blog [at] squashcampaign [dot] org. As we move into the 2000s, we can see that squatting continues, following the same pattern of ebbs and flows. Sometimes up, sometimes down. Not so organised, no squatters’ unions, but still happening. Medina House is a lovely old building on the seafront in Hove, next to the King Alfred’s Leisure Centre. 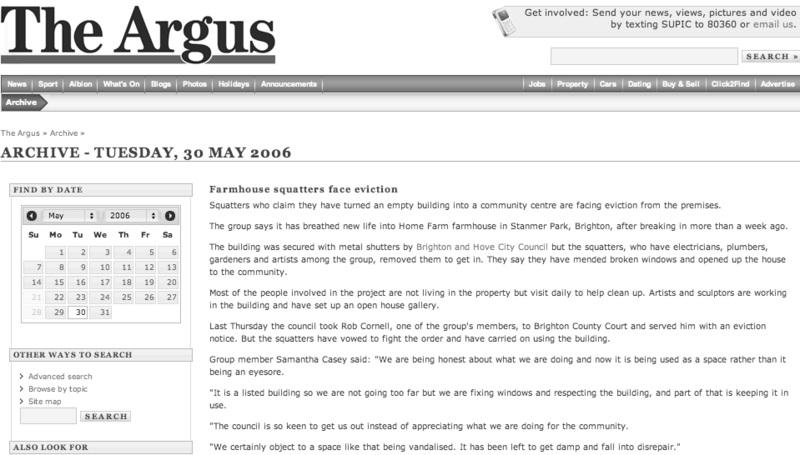 It was first squatted in 2002, but in what seems to have been a common pattern for Brighton squats at the time, it got over-run by party people, who by exploring their ‘freedom’ to make noise, angered the neighbours and got evicted. Despite all that for some reason (presumably an unfussed owner, or one that used squatters as part of his demonic plans to antagonise planners) Medina House remained occupied for years and was finally evicted in 2006. Only then to be resquatted and quickly evicted again! Now, Medina House stands empty and lonely, closed by a Fire Order after the Fire Brigade blocked up all the entrances, meaning it is a hazardous building and no-one is allowed to enter. The owner continues to press for planning permission for an obscene eight-storey block of flats. To take some other events which happened through the 2000s, in 2003, there’s a report of the Terra Audio social centre at the ex-Territorial Army barracks, on Lewes Road. According to Schnews, events were planned as follows: Punk Bands on Friday night (13th) at 10.30pm; Sunday (15th) – Evian report back and footage, riot flicks and practical positive stuff, doors open 6pm. Unfortunately the Space Invaders Festival was busted. The barracks are STILL standing empty today. 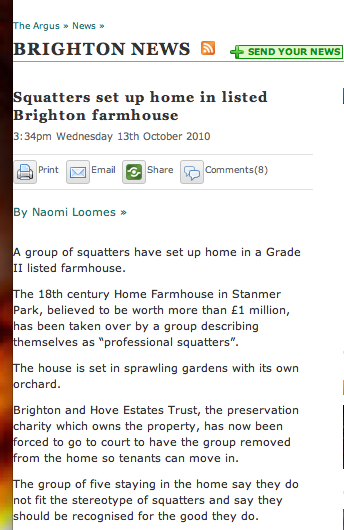 In 2006, Home Farmhouse in Stanmer Park was squatted. It was squatted again for a blissful few weeks in the summer of 2010. Clued-up Rough Music readers will surely be aware that squatting is sensible and legal. Unfortunately, reliably thick and corrupt Sussex Police don’t seem to be so clear about it, and treat squatting as one of those things that aren’t quite actually illegal but should be – like protesting, cycling and tofu. 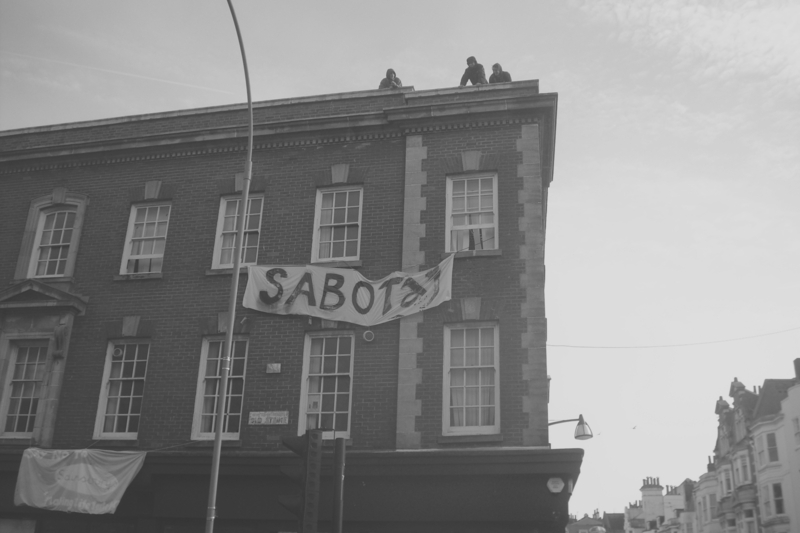 In April 2008, to tie in with the days of action in support of squats and autonomous spaces across Europe, a church was squatted on London Road. It lasted a few months and resisted eviction before being forcibly taken. It features in a film called Takeover and was briefly resquatted as a SmashEDO convergence space in 2009. The front of the church has now been converted into living space and the rest (ie the hall and a large back room) are presumably still standing empty. 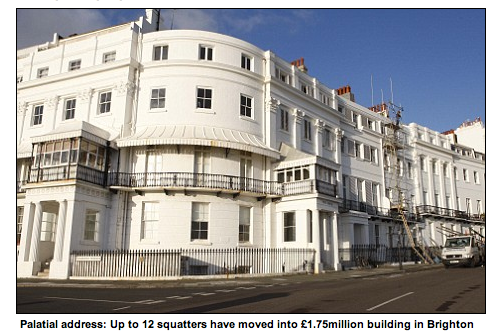 The same year saw people squatting Fife House, an opulent property on Lewes Crescent, adjacent to Sussex Square. 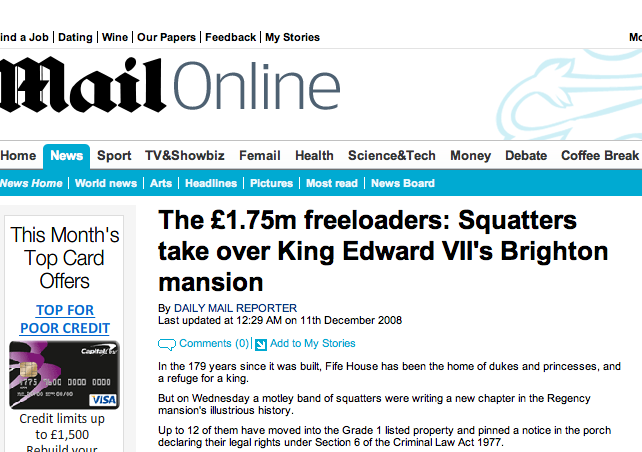 This got quite a lot of press and formed part of a whole string of stories (mainly London based) of so-called ‘millionaire squats’. Interestingly, the media (until recently at least) have been quite sympathetic to these occupations, presumably since it involves the ultrarich being punished for leaving expensive properties empty (as second or even third or even tenth houses!). 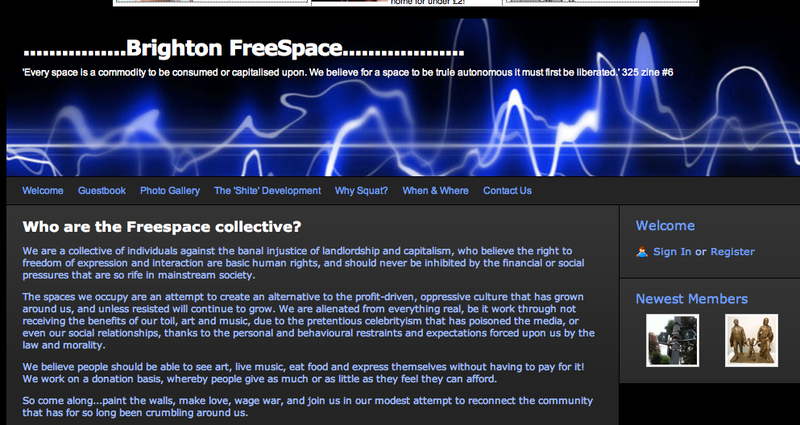 And Temporary Autonomous Art took place in Brighton for the first time, in a squatted warehouse in Portslade, in 2008. TAAs (inspired by Hakim Bey’s notion of the Temporary Autonomous Zone) have been taking place all over the country recently – in Manchester, London, Sheffield and Bristol. What began as a tactic to release creativity from the underground free party movement in London has evolved slowly into an art exhibition taking place in a squatted warehouse environment. Sadly this means that most of the interesting elements have been lost, since the events have retreated into the industrial areas of towns rather than being in confrontational yet accessible venues, such as the early London TAAs in Farringdon, Hackney and Stoke Newington. 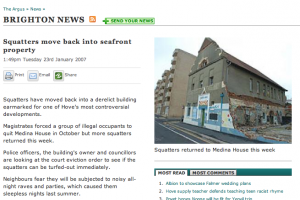 Unfortunately, the 2009 version went quite badly, with a warehouse venue in Moulsecoomb bring squatted since it was felt that a more central venue was too risky. This meant that the event catered to friends and friends of friends rather than the public. The much-vaunted clash with the Brighton Fringe didn’t happen since no-one attending the Fringe events would slog it out to the event. The 2010 version ended before it began, with the venue getting illegally evicted on the Thursday. On the flipside a positive project occurred in 2009, the Freespace collective occupied the former Gamer Heaven, a shop under a block of offices near to Preston Circus. They organised some cafes and gigs. 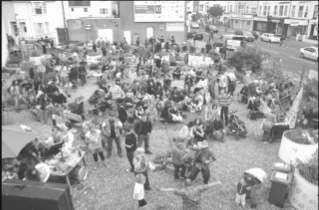 Recently there have been more positive stories for example the Taj occupation, the Lewes Road Community Garden (sadly evicted, Schmovies made a great film about it), the InItOnIt parties and the School on Old Shoreham Road. The latter had widespread local support since everyone is united in their outrage at developers who leave buildings to rot. Taj was a Brighton institution, a fruit and veg shop with two branches, one on Old Steine, one on Western Road (with a ‘secret’ third one just round the corner from Western Road). Unfortunately, the parent company defaulted on a loan and as a result went into administration, with the result that the Old Steine branch was closed. This was a talking point in the local community which only become more outraged when it emerged that Sainsburys were planning to move in. There has also been a squatted school in Lewes which originated as a south coast climate camp project, and a social centre on Churchill Square squatted in support of striking workers. It sure was nice to parade through Churchill Square, the most ugly part of town, surrounded by a group of shouting toddlers and activist parents, to be met with an occupied anti-commercial space with banners screaming ‘Strike Resist Occupy’. Sometimes even nowadays Brighton isn’t so bad. I find marches difficult as I always end up feeling impotent and sad as all the good energy dissipates, but this time, I left the march and sat down with all the other old protestheads in the centre and had a cuppa and a chat. It was a great end to the day (which in fact had only just begun).